Thu, Sep 6, 2018, 06:48 pm SL Time, ColomboPage News Desk, Sri Lanka. Sept 06, Colombo: Sri Lanka's tourist arrivals rose 4.9 percent in August this year compared to the same period last year, the data released by the Sri Lanka Tourism Development Authority (SLTDA) showed. The month recorded 200,359 tourists arriving in the country compared to the 190,928 arrived in August 2017. As at 31st August, 1,582,835 tourists had visited Sri Lanka for this year. It is a 12.5 percent growth over last year when 1,406,854 tourists had visited the country during the same period. Asia and Pacific continued to be the largest source of tourist traffic to Sri Lanka with 47% of the total traffic received in August 2018. Europe accounted for 41% of the total traffic, Middle East 6%, America 5% and Africa 0.5%. 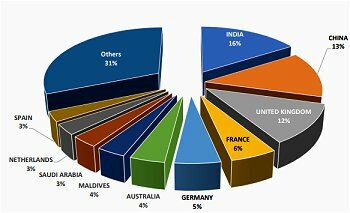 India, China, United Kingdom, France and Germany were Sri Lanka�s top five international tourist generating markets in the month of August this year. India was the largest source of tourist traffic to Sri Lanka with 16% of the total traffic received in August 2018. China accounted for 13% of the total traffic, while United Kingdom, France and Germany accounted for 12%, 6% and 5% respectively. Arrivals from North America rose 3.7 percent to 9,918 in August and the arrivals from US rose 10.7 percent to 4,410 during the month while arrivals from Canada declined by 1.0 percent. Tourist arrivals from Europe increased by 12.1 percent with the arrival of 82,167 tourists. Most of the tourists came from UK (23,643), followed by France (11,016) and Germany (10,809). Tourist arrivals from Middle East declined by 18 percent with the arrival of 11,814 visitors compared to the 14,409 arrived in August 2017. Tourist arrivals from Asia & Pacific increased slightly by 3.0 percent with 94,965 arriving in the island. Of those arrived from Asia, 32,115 were from India corresponding to an increase of 2.9 percent. Arrivals from Australia recorded 38.3 percent increase in arrivals with 8,239 visitors while arrivals from China marginally increased by 0.2 percent with 26,558 visitors.